Are you a young designer that’s been put in charge of printing all the products for your client? Are you reaching out to countless numbers of printers to see which one is the best option to work with? WHAT makes a printer the best option to work with? Slow down there, pal. 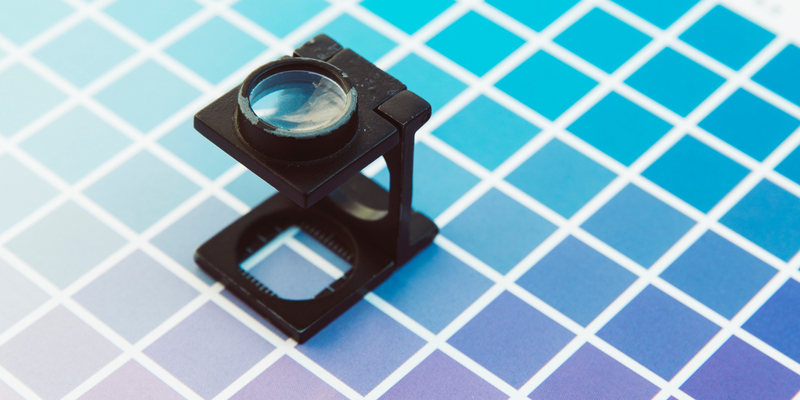 Let us help you out with the decisions you’re looking to make and give you some of the tips for finding the best printer and what you should look for when you are looking over your printing proof. Finding the Perfect Printer for the Job. One of the things you want to look for when searching for printers is customer service. You want a printing company who isn’t afraid to ask questions to thoroughly understand the scope of the projects you’re sending to them. Normally, you send them as many details as you can about the project to receive a quote from them. A printer who is thorough is going to make sure that, if you left something out, they ask you the details and get you the quote that is going to be closest to your final cost. Another huge plus is when the printer sends you images and/or samples of projects they have done in the past that relate to the current project you are looking to get printed. Seeing pieces of past work shows that they are willing to go the extra step to get you these samples and that they are proud of their work and materials. How do you know when a printer has poor customer service? For starters, emails may seem a bit unprofessional; complete with ‘lol’s and smiley faces. They don’t ask questions right away, which can lengthen the time it takes for them to get you a correct quote. Another problem with them not asking questions right away is the possibility that your quote is wrong when you get it back. If you catch it, you can have them redo it. If you don’t catch it, it will look bad to the client when they get their final invoice. Once You Find Your Printer. Okay, so your quote makes sense for you and your client, all of their past work is top notch, and they treat you like royalty. Before sending over all files for mass production (MP) make sure they are able to give you a physical proof of what you are printing. Some printers charge for this, however, if you really care about the project you’re printing, and you’re spending tons of money, you NEED to make sure the physical proof matches up to what you had in mind. With this proof, you are able to check color, alignment, and ensure barcodes and QR codes are able to be scanned. I’ve learned through multiple projects that it doesn’t matter the size of your business or the amount of money you have for your project, you need to find a printer making quality prints. If things don’t line up – your barcodes don’t scan, and your colors are off – there may be a problem. Talk to your printer about the issues you see. If their answer seems fishy or unprofessional, maybe it’s time to take a step back and find someone you can trust with your $50,000 print job. Try to keep a positive relationship with your printer because if they do a great job, and they offer the type of printing that you would like, then keeping that relationship moving is important. This could be as simple as sending thank you cards whenever you finish another project or emailing the team during the holidays to wish them well. Being kind will get you far. 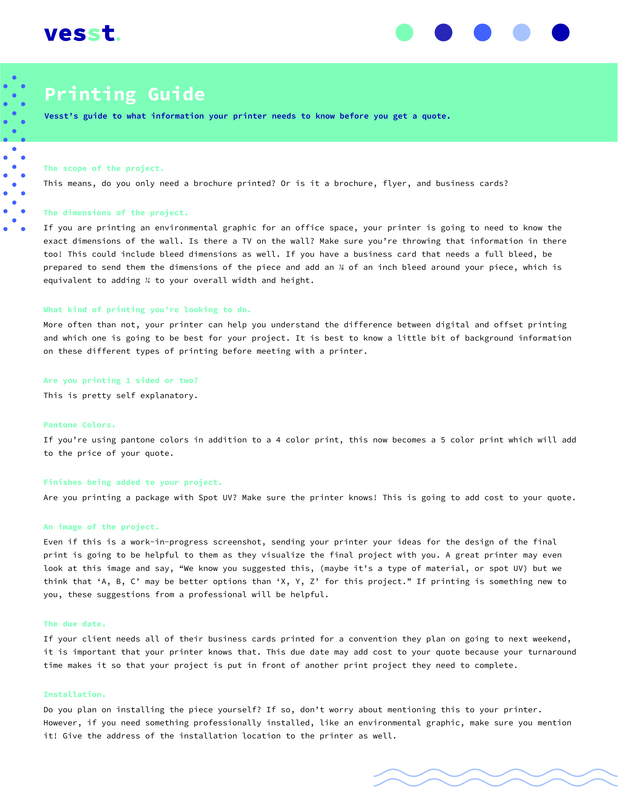 Download this free guide for the information you should be sending your printer for each print project! We get to work with you, making your goals real, making your sales higher, and making your business life less stressful. © Vesst 2019. All Rights Reserved.